Chapter 7 introduces a new time signature, 6/8. This is also known as jig time. There are two beats in the bar and these two beats are subdivided into threes. 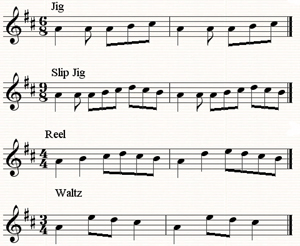 The slip jig time signature is also introduced, these have three beats in the bar, each beat also subdivided into threes. Have a listen to the audio lesson and watch the movies.